One of the most common questions I encountered whilst I was working the floors of Apple retail was “How can I connect my non-airport-extreme Mac to connect to my wireless network at home/work?” Now depending on the make and model of the Mac they were referring to the majority of time you ended up telling the customer to look on eBay and alike because to actually *buy* an original airport card via Apple’s service parts scheme was ridiculously pricey and the idea of having a rather sightly ethernet cable for only $10 was looking more and more attractive with each passing second. Had I known then what I know now a lot of customer may have walked out of my fair little shoppe with a much happier feeling of Apple warmness and love in the world. 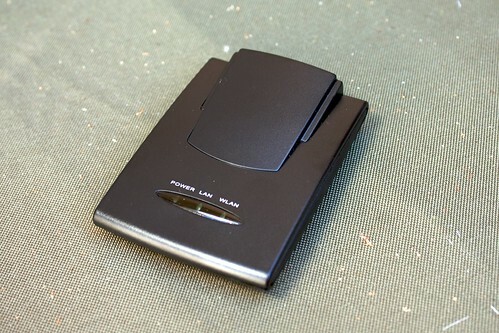 I am talking of course about this wondrous gap-filling gem the “Macsense Aeropad Mini Network Adpator”. 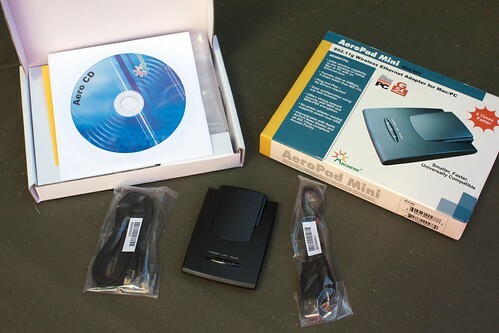 Compatible with 802.11b/g networks (sorry for all those n’ers out there) and both WEP & WPA security compliant the Aeropad Mini achieves where USB wireless adaptors generally fail; it works, and at that it works *without* extra software! Setting up the device is pretty straight forward, in less than five minutes I’d gone from opening the box to browsing over wifi on my Dad’s long lacking Mac Mini. Powered via USB the only other connection is an ethernet cable, the included “Quick Start Guide” then walks you through the necessary steps to configure Mac OS X’s Network Preference Pane and the web based configuration of the device itself, in a fashion similar to that of your ADSL modem/router. During the wizard process you’re prompted to provide your wireless network’s name (SSID) and security settings (WEP, & WPA are supported) but what might scare some punters is that you’ll need to know what channel your network is using, something that’s easily figured out but not often asked for. What I love about this little thing is that it gives all those legacy Mac fanatics a working option now. Sure there may not be a massive market if this product was for Mac’s alone but it’s also said to work with pretty much anything that has a spare USB port and ethernet, the documentation says you can even use it with an Xbox! At the same time, whilst technically you could, I can’t see too many people wanting to use this as a mobile solution for the older iBook/Powerbook. Sure it’ll work the same way but it would be a clunky solution if you were one that moved around a lot; a shift from the dining room table to the couch would require a reconnection of cables and a rather large dongle flapping around. Keep in mind I wouldn’t recommend this to your average ham sandwich consumer. Should anything go wrong with the connection, or even the set up itself there are multiple gates to check and I couldn’t stamp the product with “Your Mum could do it” label. I dare say that could account for a lot of bad reviews I’ve seen about the place for the Aeropad? All I have to go on is my experience and so far that experience has been life saving! 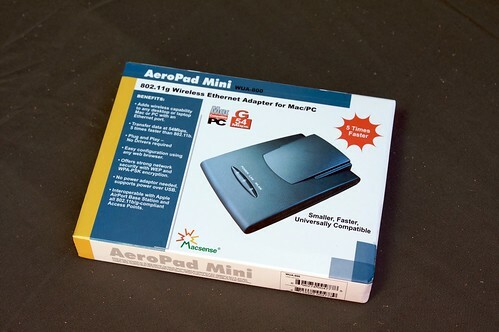 The Aeropad Mini is available from Macsense at a RRP of $145.